There is a change over in the system of MCGM tax/property tax from Rateable Value system to Capital Value system. This is with effect from 1st April, 2010 retrospectively. MCGM is sending Special Notices to owners of all buildings/properties i.e. Co-operative Housing Societies as well landlords of buildings. Most of the owners have received the said notice. As per the Notice, the tax payers can file objections within 21 days to any of the particulars of property like built up area, factors, categories, capital values, etc. The Notice states that -“for details of the factors and categories of users of buildings and weightage by multiplication to be assigned to- please refer to MCGM website- www.mcgm.gov.in. (A Sample Notice is attached herewith). The MCGM website shows the Rules for Fixing Capital Value of Lands and Buildings which contains such critical information for calculation of capital value of buildings/flats and the tax payable in the section called “News and Events” and as such is not easy to locate. The said Rules which provide details of the factors and categories of users of buildings, nature and type of building, age factor, floor factor and weightage by multiplication to be assigned thereto and also the tax rate are very important for all citizens for calculating the tax payable. Therefore, the Final Rules should be posted prominently on MCGM website under a separate and specific heading. (Final Rules are attached herewith). It is also desirable to post on the MCGM website the main BMC Act and particularly the Amending Act (effecting change in the tax system) as there are references to various sections of the Act in the Special Notice as well as the Rules. The Notice also states that “For details of Zone, Subzone, and base values, please refer to the Stamp Duty Ready Reckoner of the year 2010”. Since the market value (called base value) of the properties is as per the Stamp Duty Ready Reckoner (SDRR), the complete SDRR of the year 2010 should also be posted on the MCGM website for ready reference. This is very important as the entire new tax system is based upon SDRR and without its ready and easy availability a tax payer cannot have the complete picture regarding his tax payment responsibility. The said Special Notices are being sent by the MCGM to landlords, housing societies etc. It is possible that the landlords or the Society officials may not circulate copies to the tenants and the members who are important stake holders in the matter. It would be hence desirable that the MCGM issues an advisory or direction to the owners/addressees of the Special Notices to circulate them to all the occupants in the building to enable them to send their comments and objections, if any, to the MCGM in time. This will save a lot of potential disputes and litigations which can unnecessarily jeopardize the new tax system. The 21 days time given for response/objections is not at all adequate. The MCGM has taken good 3 years to set the new tax regime in motion but has given only 3 weeks to respond to the Notice and all the property facts and the parameters stated in the attachments. It is suggested that the time should be extended at least to 60 days. The change over in the system for levy of BMC tax/property tax impacts all citizens of Mumbai. Therefore, the entire process has to be transparent and citizens should not be compelled to run from pillar to post. we got letter too, but they love to harass us, & they are doing this from 2007 onwards, g-north department. for same previous usage & same area, they are charging differently, our 22000 property tax shoot to 95000 & similar usage on different floor, were not even doubled, they had 38000 now 66000.
and if we fight we have to struggle for at least 6-7 years, which we are doing from 2007. (at that time they have charged us property tax on rent we have received. if we have received 10000 rent then as per laws (yes) we have to give at least 7000 ( almost 70% of the rent), they have solved that case in end of 2011. & after giving us 1 year of rest, they will start eating our flash for more 7 years. god save us from this demons. I have served in Indian Army and retired in the year 1969 and drawing pension. I had purchased a flat in Suburban Andheri(W) for residential purpose. Am I exempted from property tax payment of the MCGM as my society asked me to pay property tax. Kindly let me know about the rule position of the Corporation and its Gr about exemption. 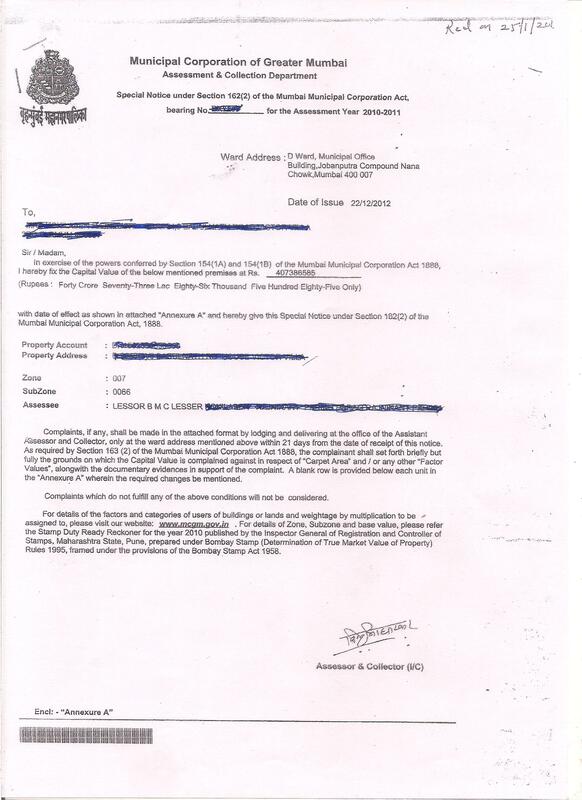 We have received property tax notice from BMC, We have ready to pay ,We have some disputes with builder and We all residential like to pay our Property tax individually , Can it possible to pay or any other option ? We have ask same to Ward officer but as per them we need to first pay all the dues but it not possible as Builder is owner of 25% property and his is not ready to pay his dues.